The City of Subiaco Council is against renaming Subiaco Oval saying the change is disrespectful of more than 100 years of football heritage. The WA Football Commission and stockbroking firm Patersons Securities confirmed a deal earlier this month to rename the sports ground Patersons Stadium. Subiaco Mayor Heather Henderson said the Council was opposed to the deal. “The history and heritage of the name ‘Subiaco Oval’ as a home for football shouldn’t be sold off for short -term financial gains,” she said. 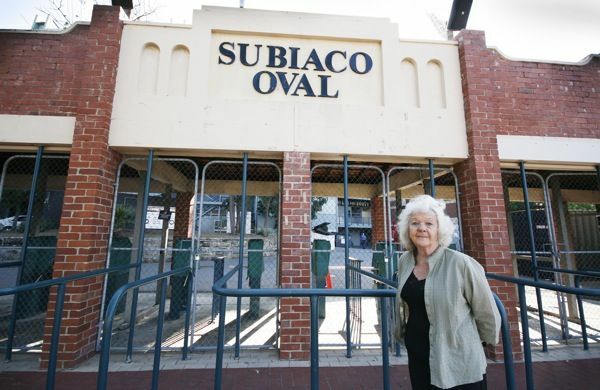 Ms Henderson said the City of Subiaco leases the oval to the WAFC and the oval could never be completely renamed. Subi forever: Subiaco Mayor Heather Henderson stands outside the heritage-listed Subiaco gates. “The oval will always have the name ‘Subiaco Oval’ on the sign because the gate is heritage listed,” she said. Patersons Securities executive chairman Michael Manford said the sign was not an issue because their branding would be prominent throughout the stadium and the deal was beneficial to WA football. The $3.5 million sponsorship will fund facility improvements, coaching programs, indigenous and multicultural strategies while expanding football districts. “We see this as a great opportunity to put money into football at a community level and at the same time build and grow Patersons’ brand in WA,” Mr Manford said. However the general public has expressed displeasure at the new naming rights. Perth resident and football fan Grant Lazarus is against the new Patersons name. “I don’t think the name should change because it is iconic its own way and some of that history would be lost,” he said. The social networking site Facebook has also been used as a forum of protest with more than 10,000 users joining a group named ‘I refuse to call Subiaco Oval Patersons Stadium’. Some group members support the name change. WAFC spokesman Steve Tuohey understands the concerns of those who are against the name, but said he was convinced the name change was the right move. “We certainly respect the opinions of those who oppose the name change but they have to realise that this is a commercial reality of the sporting world,” he said. “Stadiums require lots of funding to meet their running costs which is why commercial names for stadiums is increasing. Mr Tuohey said the funding would be beneficial for local football and would help the recent growth in participation. “The money will go towards running competitions, improving facilities, organising development programs and particularly working with indigenous communities and in under-privileged or remote areas,” he said. Subiaco Oval will be known as Patersons Stadium until at least September 2014.